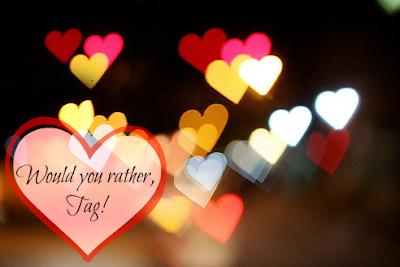 GotToLove♥: Would you rather?- Tag. 1. Would you rather lose all of your mascaras, eyeliners, lipstick and lip glosses or lose all of your pallets and eyeshadows? This was probably the easiest question for me to answer as, to be honest, I don't really use pallets or eyeshadows that often at all so I'd definitely lose those. I said in my Lipstick Collection post that if I don't have some type of colour of my lips I look dead and no one wants they, do they...? 2. Would you rather shave all your hair off or never be able to cut it? Now, I really want longer hair,but if I could never even have a trim I would not be able to deal with the spilt ends! So I'd definitely go for the skin-head look, and wear some awesome wigs, crack out some pink hair or Barbie blonde! I would have to say a pink cheek, because as scandalous as this is I do not own any coral blushes! I know, it's awful, I should be killed but I've just never really got round to many any blushes so my only option is a pink cheek. I could go out and by some coral blushes though but I don't even know if it suits me, so it could be a silly mistake. This is a really hard question... ermm, I'd have to say clothes I guess. I do love make-up a lot but for some reason I feel less guilty spending a lot of money on it than I do with clothes. So blowing a grand on clothes would be fantastic, I could actually divert from Primark! Well I was thinking eyeliner as lipstick but you don't have much of a selection of colour, you'd have to have like black lips! So I'd say lipstick as eyeliner, you could just use a small brush to apply it rather than using the chunky lipstick. 6. Would you rather shop only at MAC or Sephora? I think that MAC products are gorgeous -even though I don't own any!- But I don't think I could be limited to just one brand, I'd get too tempted to go to others brands! From my answer on the first question I'm sure you can guess that I'd need more than one lip colour! I only really use one eyeshadow on the reg's anyway and that's just a white eyeshadow in the corner of my eye to brighten them up, so this question suits me quite well! I feel the cold quite a lot and I live in England so I barely have a Summer anyway, so I would go for Winter Clothes in Summer. Saying this though my version of winter clothes very rarely includes a coat, for me I probably wouldn't even work up a sweat if I was dressed for Winter in Summer. Definitely bright nails, they make me really cheerful. In Autumn and Winter I wear a lot of darker clothes so having a bright nail is really necessary for me. 10. Would you rather give up your favourite lip colour or your favourite eye product? I feel like this is a bit contradictory to some of my other answers as I would give up my favourite lip colour which is probably, Gypsy by ELF. Just because I need my mascara, it's not even that great but it's my favourite and I have other lip colours I like so, oh well Gypsy! 11. Would you rather only be able to wear your hair in a pony-tail or messy bun? The messy-bun wins this hands down, I love having a messy bun, I think it looks so sophisticated but casual at the same time! Check out my post on how I create my bun here. Also I'm just not that good at making a pony tail, I just can't get the volume at the top, if you have any tips on this please leave me a comment below. 12. Would you rather never being able to paint your nails or never to use lipgloss? 13. Would you rather shave your eyebrows and have none at all, or sharpie them in everyday? Lets just go for it, I'd sharpie them in! If I was to find a brown sharpie and sort of smudge it to blend in more with my eyebrows, I think it could work right? Well I hope you enjoyed this post, and I apologise for my melodramatic ending of the questions and I didn't really cry in the corner...-lie-. Leave me comments linking to your tag's so everyone can have a read including me! Speak soon, becciixx. Love your blog.Will be eagerly waiting for more. Great post!! I like your blog!! Hope you visit mine!! I love this kind of post it's great to get to know better who you are reading! We agree in almost everything! I love this tag, it is very funny to do and read! I love that little picture!